GET MOVING! Get that blood circulation going, hit the gym, go for a run! The more you move the more you lose! More importantly, it is good for your mind and body! Kick the Calories! Say goodbye to hidden calories! There are hidden calories everywhere these days, from unhealthy supermarket buys, to those sneaky restaurant appetizers. It takes about 3500 calories to form one pound of fat. Sounds like a lot right, but if you consider that there are some dishes that contain over 1000 calories, it is no wonder that we are experiencing a world wide obesity problem. It is very easy for us to over-indulge and to exceed out daily calorie limit. However the bottom line is, if you want to lose weight, you have to cut calories. To do this you have to identify where your extra calories are coming from. Here are a few ways that you can cut between 200 – 500 calories everyday. Before long, you will find it much easier to shed those unwanted pounds. 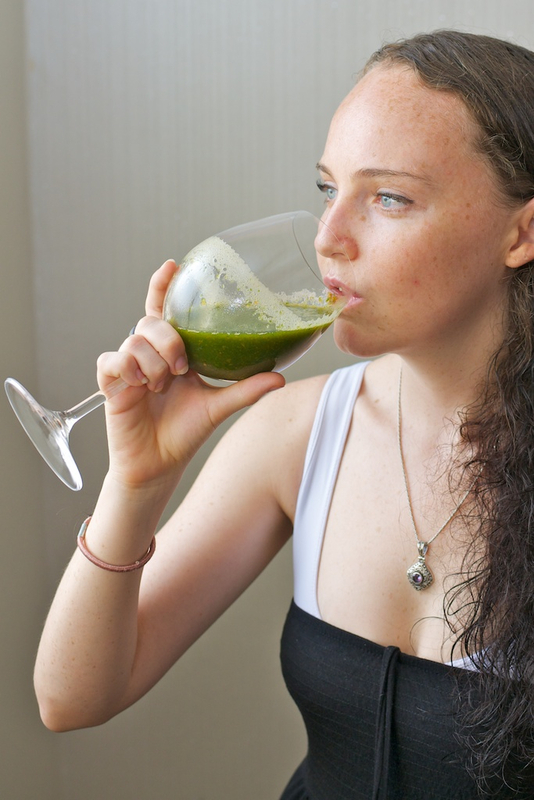 Drinks are the biggest culprits in aiding our over-indulgence. It is easy to drink our daily calorie allowance! For example – one glass of orange juice with breakfast – 170 cals, cappuccino – 210 cals, fruit smoothie – 300 cals, sweetened Icetea- 120 cals, glass of wine with dinner – 100 cals – Total – 900 cals! CUT CALORIES – swap these drinks with good old water or tea. If you feel like you need a caffine fix, go for skim milk or a plain espresso or black coffee. Also, dilute your fruit juices with water to save you some calories. You can save between 200-300 calories by watching what you drink. We all love the occasional bag of crisps, or block (slab) of chocolate. But these can cost us in the calorie department. A bag of crips can hold up to 300 calories, and it won’t even keep you full for long. CUT CALORIES – It’s easy, swop the snacks for raw fruits and vegetables. They have better nutritional value, and can tame that sugar/carb craving ASAP. Swop the crisps for a hand full of nuts, or dried fruit. Change White bread (1 slice 70 cals) to Whole grain (1 slice 50 cals) Sometimes whole grain can have more, but the nutritional values far exceed white bread. Swap the cream based soups and pasta sauces for Tomato or Veg based ones. Cream based soups and pastas are far higher in calories, opt for less processed and organic tomato or veg based products. Ditch the butter – Really! It is so bad for you, just cut it out! 1 pat of butter packs 36 calories! Imagine the caloric disaster on your potatoes! Also ditch the mayonaise, a tablespoon on your sandwich will cost you 100 calories. Change from butter and mayo to reduced fat olive oil spread. Or you can mash some avo and use it as a spread instead. Better yet – skip them entirely! Don’t buy crumbed meats/products – Crumbed chicken breasts can pack up to 350 calories per serving. The bread crumbs add unnecessary calories and absorb more oil when cooking. Buy skinless meats – The skin has a lot of calories ( 250 cals) and unhealthy fats, skinless chicken breasts contain a lot less calories (150cals). The skin also absorbs more oil when cooking, making your meal much higher in calories. Save up to 200 calories by buying skinless. Skip the ice cream – the average 140 grams of vanilla ice cream has 300 calories. 1/4 of your daily allowance. For a more healthy frozen fix, freeze some fat-free or low fat yogurt. Better yet, freeze some sweet fruit such as grapes, strawberries, pineapple and mango! Save up to 200 calories! Swap white potatoes (218 calories) for sweet potatoes (150 cals) – Sweet potatoes are load with great vitamins and nutrients. Add cinnamon on top for a delicious snack. TIP – When you are preparing meals at home, the closer a food is to it’s natural state, the better. Reduce your portion size – Most restaurants have over-sized portions. Ask if you can get a smaller (sometimes called ‘ladies’) portion, if not, bag half and take it home and eat it as another meal. Learn danger words on the menu – Avoid words such as fried, crispy, breaded, creamy and cheesy – these dishes will be high in calories because of ingredients or cooking methods. Go for dishes that sound more like this – grilled, baked, oven roasted, steamed. Skip the befores and afters – That bread bowl that floats around before your meal is packed with calories. Hold out for your main meal. If you want to have a starter, indulge in a vegetable based soup, or salad. Similarly, pay attention to the dessert that you are eating, have a coffee, or a fruit salad instead of that full cream chocolate mousse cake! Cutting calories is easy! Think about what you’re eating, drinking, and most importantly buying. If you don’t have the junk in your house – YOU WON’T EAT IT! Here’s to a healthier, slimmer you! 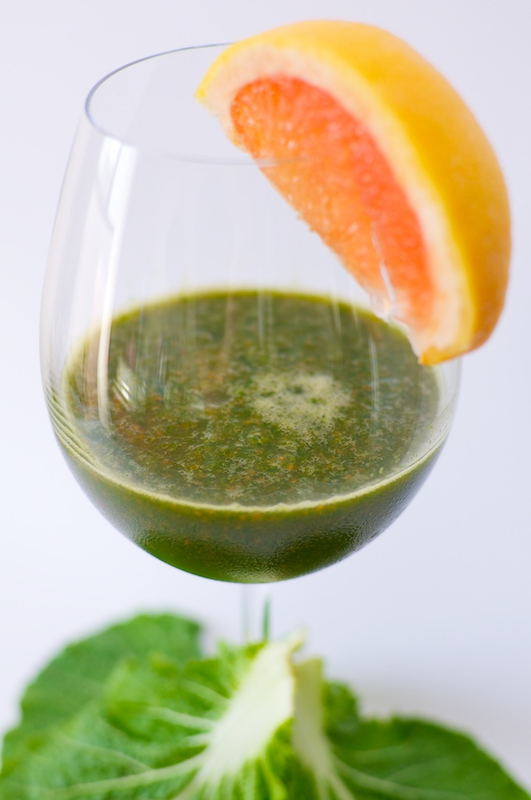 So start your day off with a green smoothie! The one in the picture was made using spinach, lettuce, carrots, cucumber and tomato. Here’s to a healthy weekend! This is an easy dish that you can make with pretty much any ingredients. The actual cooking time is minimal. However, if you use chickpeas, be prepared for some preparation. 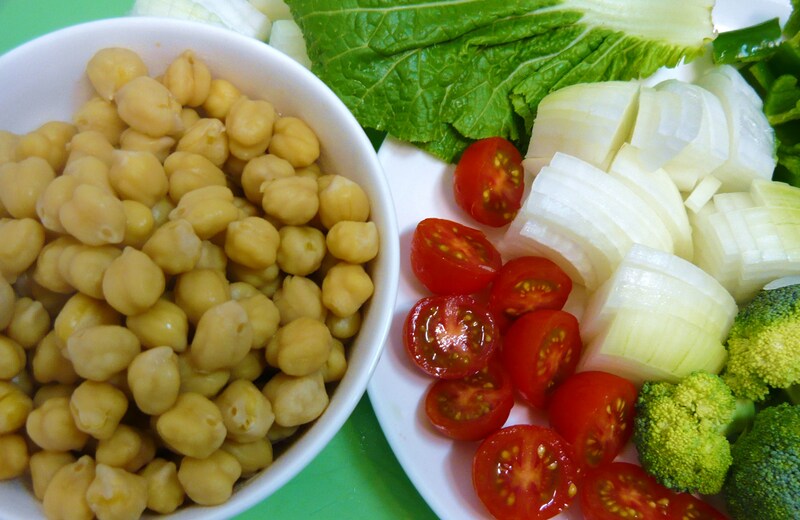 Chickpeas are a great source of protien and fibre. If you buy dried chickpeas, you should soak them overnight, then boil them for about an hour or so. However, you can buy them already tinned! 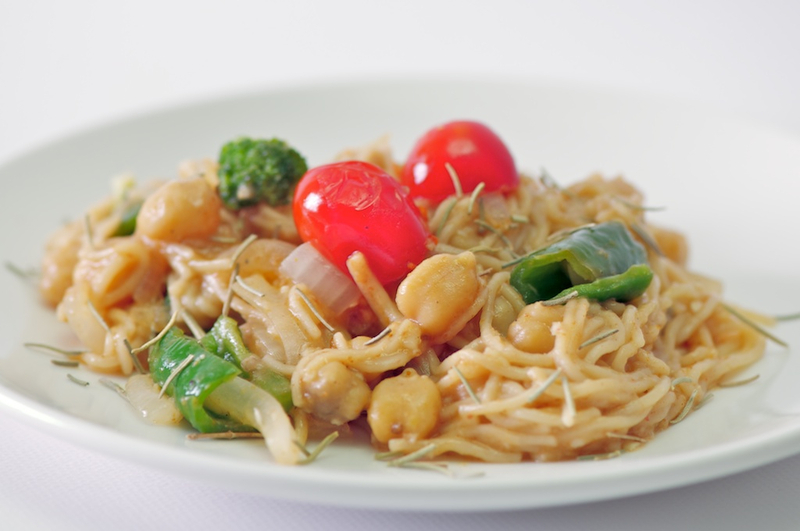 I use soy bean noodles, they do not contain wheat or flour, and are usually lower in calories than regular noodles. But, if it is difficult to find these, just use a suitable substitute. Lightly sauté the spinach and onion in olive oil, then add all the other vegetables. Do not overcook, just sauté lightly. Add the chickpeas, garlic and curry powder, mix all together and apply a low heat for about 2 mins. Add the soy bean noodles, mix together, and apply a low heat for another two minutes. Leave to cool, and serve! It is great to garnish with a little rosemary or basil! What is the biggest thing that keeps you from exercising? Fighting the winter slump with soup! Turn your frown upside down, Bad days gone good! My Fall Favorite – Pumpkin and Spinach Soup! Green smoothie of the week – Kiwi and banana! Meditation – how to do it, and how it will change your life.